Rabat - Pope Francis landed in Morocco on Saturday for a trip aimed at highlighting the North African nation’s Christian-Muslim ties, while also showing solidarity with migrants at Europe’s door and tending to a tiny Catholic flock. 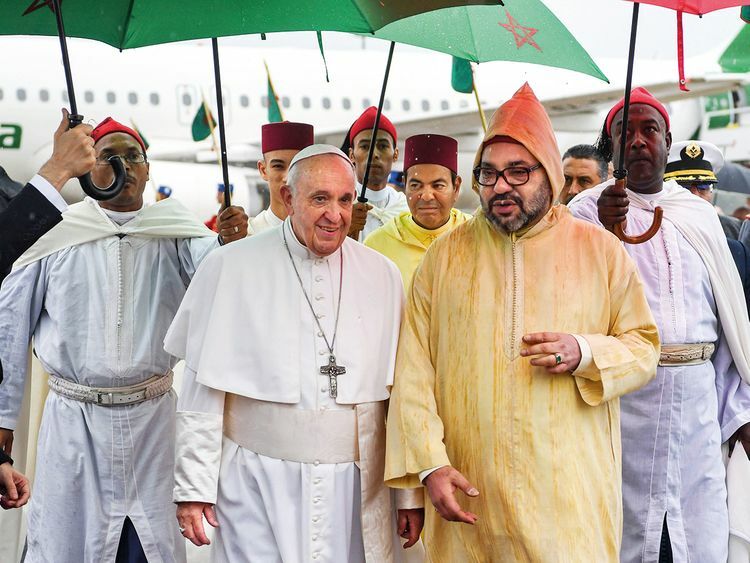 Moroccan King Mohammad VI was on hand to greet Francis when he arrived amid pouring rain in Rabat, the Moroccan capital. The highlight of the trip is likely to be Francis’ visit Saturday to the Mohammad VI Institute, a school of learning for imams that epitomises Morocco’s efforts to promote a moderate brand of Islam and export it via preachers to Africa, the Middle East and Europe. Francis will also visit a migrant centre run by the Caritas charity organization and will wrap up his trip Sunday with a Mass and a meeting with Moroccan clergy. The weekend trip follows Francis’ February visit to the UAE, where the pope and the imam of Cairo’s Al Azhar, the seat of Sunni learning, signed a landmark joint statement establishing the relationship between Catholics and Muslims as brothers, with a common mission to promote peace. The “Human Fraternity” document outlines a shared set of values and principles common to Christians and Muslims, focusing on the dignity of every person and rejecting violence committed in God’s name. The pope is travelling to Morocco 34 years after St. John Paul II became the first pope to visit the country. The rising numbers of migrants coming in and trying to cross into Europe have put pressures on the kingdom, and become a hot political issue in Spain ahead of that country’s April 28 general election.